April in Washington DC is just beautiful - the cherry blossoms were a very welcome sign that spring is at last, really here. The final exhibit at the Textile Museum in its current location is: Out of Southeast Asia: Art that Sustains. Historical textiles from the collection along with wonderful contemporary works by batik artists Nia Fliam, Agus Ismoyo, and Vernal Bogren Swift, and weaver Carol Cassidy. If you are in the area --> Go! 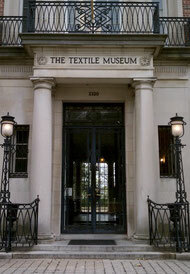 The Textile Museum will close in October to relocate and reopen in fall 2014.